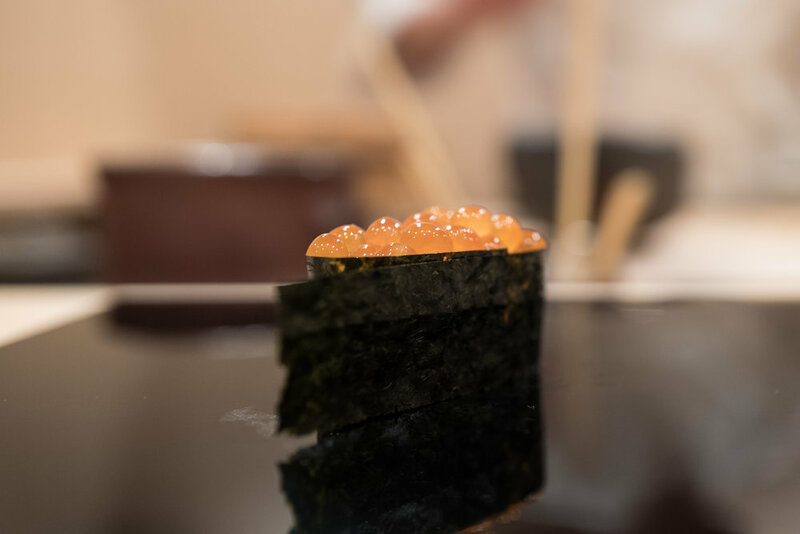 Sushi Taichi, which I have written about before, is one of my absolute favorite sushi shops. So, needless to say, I was really excited to hear that Keita Aoyama-san, long-time apprentice at Sushi Taichi, was opening his own shop. Sushi Keita opened in September of 2017, and I was able to visit in November. 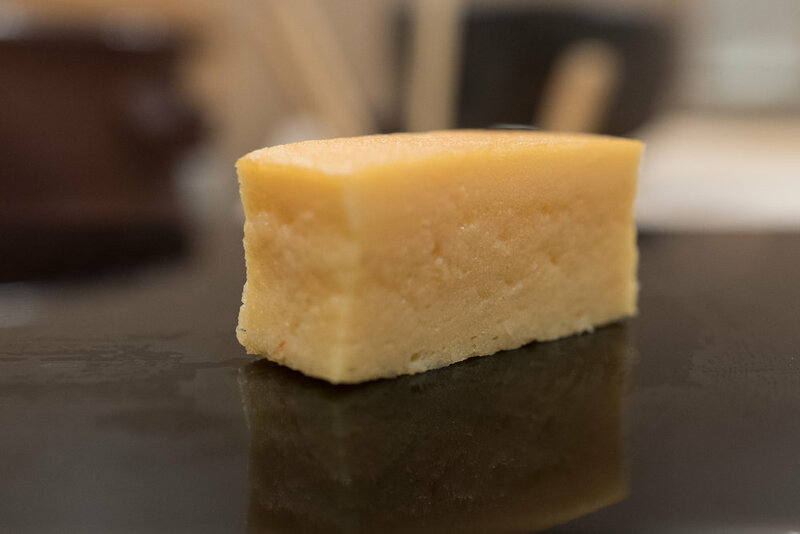 The shop is located on a mixed residential and commercial street in Tsukiji, on the east side of Harumidori, a couple of blocks away from the famous Hongan-ji Buddhist temple. The shop itself is very nice and quite tiny with only 7 seats at the beautiful wooden counter. Keita Aoyama-san is the lone chef behind the bar, and his lovely wife serves as the shop's okami. And, as expected, the sushi is so good. Even though I visited at lunch, I ordered the full nighttime omakase with otsumami. 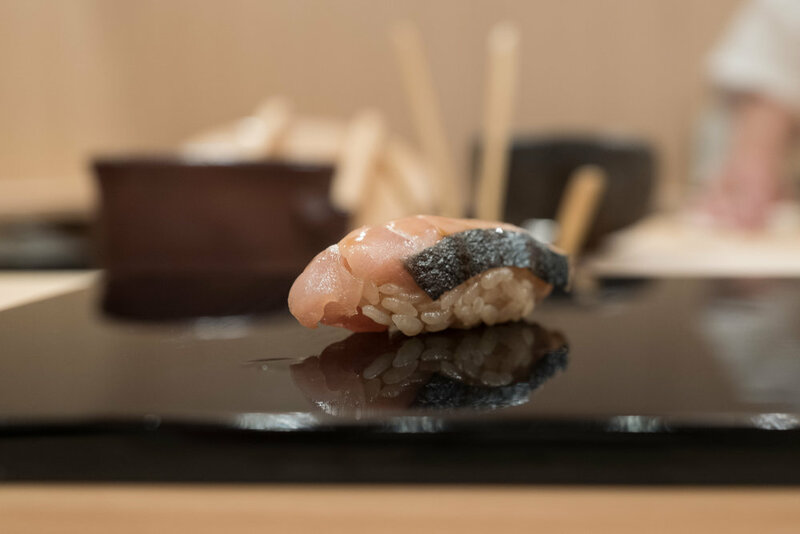 Keita offers very affordable lunch sets but also makes the more expensive omakase option available to those who want it. Over the course of 90 minutes, I was served 7 otsumami and 16 pieces of nigiri. Total cost with 1 beer and plenty of nihonshu? A ridiculously low ¥17,000 (roughly $156 USD) - a truly amazing C/P value. 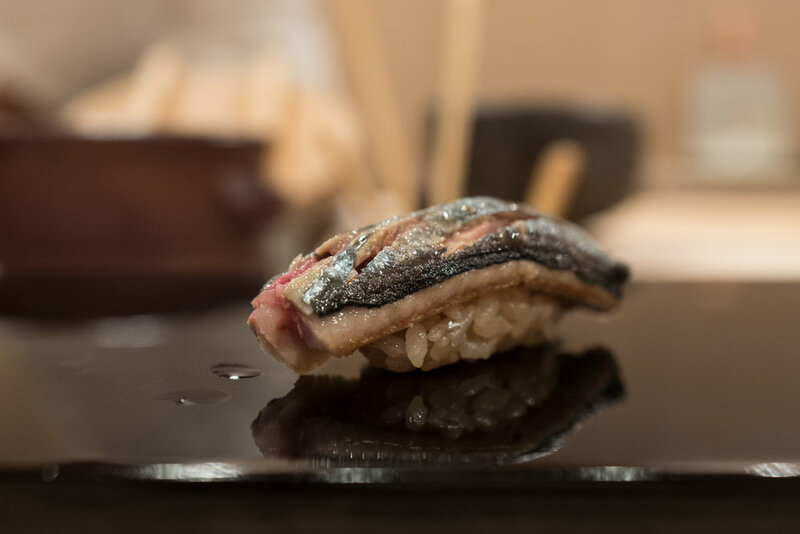 The sushi, of course, is reminiscent of Taichi-san's style: medium sized pieces, an emphasis on seasonal items, and shari seasoned with akazu and salt. 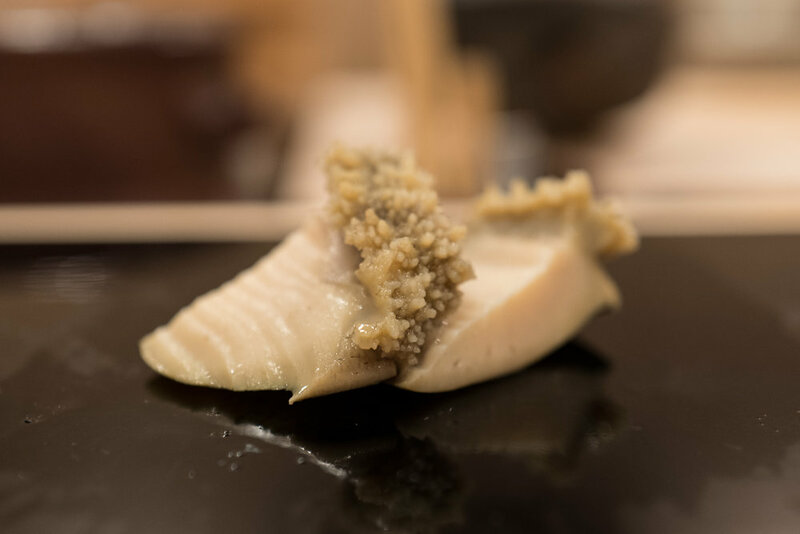 Keita's shari is more strongly vinegared than Taichi's - it has a good sourness to it and a lot of presence. It is frankly one of the best calibrated shari I have had anywhere. This fantastic shari is paired with excellent quality neta prepared expertly. 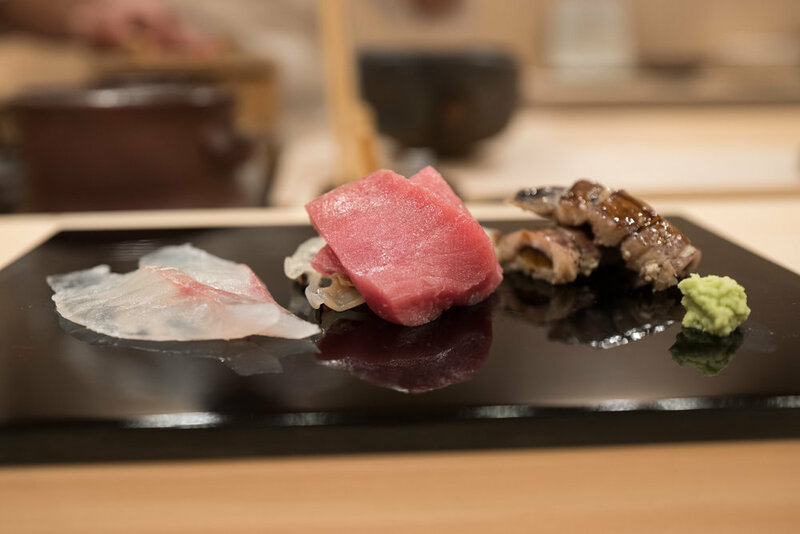 Some pieces, like the fantastic kohada, the delicious maguro from Oma, and the sawara, are right up there with the best I've ever had. 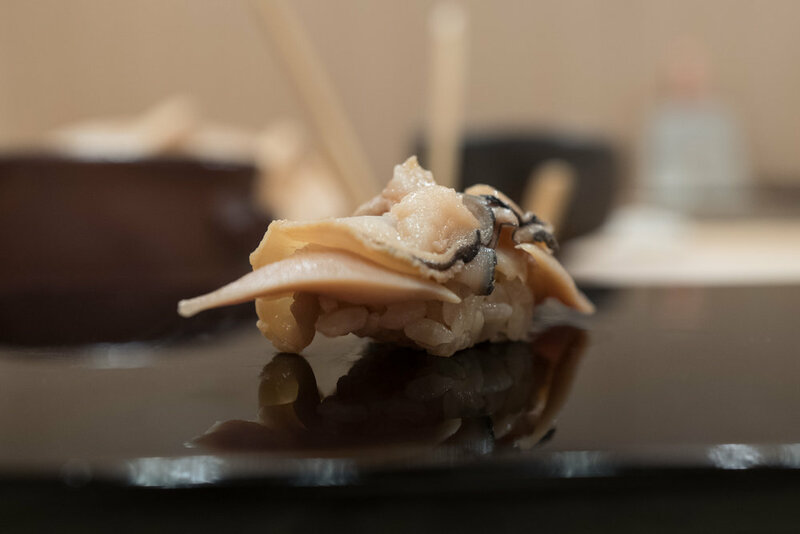 And the otsumami are world-class too! I particularly enjoyed the soufflé-like preparation of shirako, the delectable shako, and the awabi. The chef and his wife are really friendly, and the shop's easygoing atmosphere reflects this. 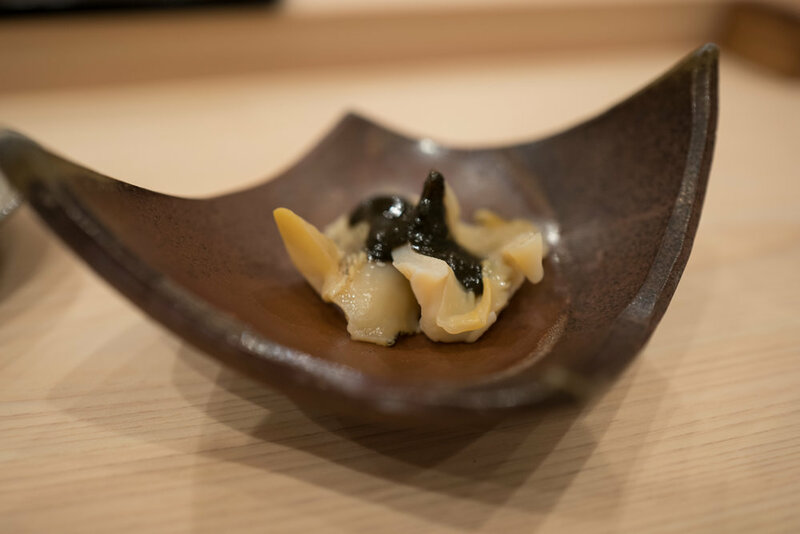 Pair this with world-class sushi at very reasonable prices, and it is no wonder that this restaurant is already becoming very hard to book. I imagine that within a year it will be an extremely difficult reservation. 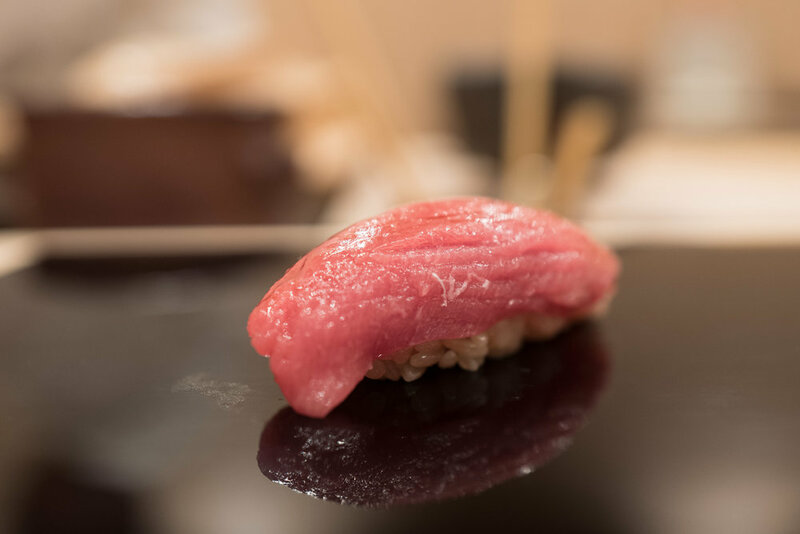 I look forward to going back for a second visit in couple of months; Keita has already earned a spot in my "top 5 favorite Tokyo sushiya" list. Below you will find photos of all the dishes in the order they were served, along with some additional notes. Off to a good start with the first otsumami plate. The shako (right) was particularly tasty. The soufflé-like shirako preparation was one of my favorite otsumami served. At the end of the meal, chef Keita realized he forgot to serve me a piece of hamaguri. He laughed, apologized, and offered it to me as a final piece. It was delicious, and actually a nice way to end the meal. Note: reservations are required and should be secured at least 4 weeks in advance.